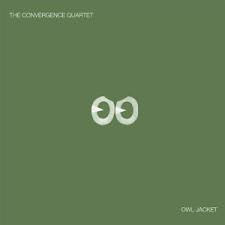 The Convergence Quartet is a significant gathering of notable instrumentalists who also compose/arrange, in a provocative limited-edition LP release of six numbers entitled Owl Jacket (NoBusiness Records NBLP84). Specifically this is a cooperative venture between Taylor Ho Bynam on cornet, Harris Eisenstadt on drums, Alexander Hawkins on piano and Dominic Lash on bass. Harris arranges two traditional Ghanaian songs, "Dogbe Na Wo Lo" and "Mamady Wo Murado Sa;" Dominic gives us "Jacket" and "Azalpho;" Taylor contributes "Coyote;" and Alexander comes up with "Owl." The music is smartly free but also structured by the compositions-arrangements. All four give us original improvisational inventions that work together well in the four-way. When combined with unusual and idiomatically structured compositional ideas the whole set stands out. Bynum's "Coyote" and Alexander's "Owl" are good examples. They both have a memorable post-modern/post-minimal circular melodic head structure that sets up what the ensemble improvises off of in excellent ways. In the end the music stays with you. It shows off the ingenuity and creativity of the foursome while also letting your ears grab onto compositional guideposts that lead you through the journey. A seminal release that gets better and better the more you listen. Only 300 copies have been pressed, so get this one now if you can. Thanks for this info, Lee. Excellent album.